San Juan Pacific Railway corporate advertising logo. In the aftermath of the San Francisco Earthquake in April 1906, demand for building materials exponentially increased across the West Coast. Many railroad sprang up in the aftermath, including the San Juan Pacific Railway operating out of Chittenden Station in Santa Cruz County. The primary and initial purpose of this railroad was to connect the San Juan Portal Cement Company plant at the mouth of the San Juan Valley to the Southern Pacific Railroad's Coast Division track eight miles to the north. In addition, the company planned to operate a clay quarry directly out of Chittenden using the reserves found in the hills above the Pajaro River. In the grander scheme of things, this new railway was to serve as an essential component of the larger Ocean Shore Railroad project, acting as a connector between the Ocean Shore & Eastern Railroad, which was anticipated to run between Santa Cruz and Chittenden, and the San Joaquin Valley Western Railroad, which was anticipated to connect Fresno and Hollister. Thus, it is unsurprising to find among the financiers and major employees of this short-line many of the same people who were behind the Ocean Shore project. Indeed, most of the railroad's rolling stock would be Ocean Shore equipment. The San Juan & Chittenden Railway was incorporated by local businesspeople on May 4, 1907. Construction on the route began almost immediately with the only significant bridge being located immediately south of Chittenden over the Pajaro River. The vast majority of this route was in San Benito County but the line proved to be entirely dependent on its connection to the trackage in Santa Cruz. By the end of August, a standard-gauge track had been built to San Juan Bautista and to the site of the cement plant, and soon after the route was completed, materials were shipped over the line to begin the erection of the plant. Not long after the plant was complete, the railroad rebranded itself as the San Juan Pacific Railway and corporate leadership formally shifted to the San Juan Portland Cement Company, the Palmer Oil Company, and the San Joaquin Valley Western Railroad, although all three had doubtlessly played a role in the company's initial incorporation. The initial rolling stock of the railroad was composed of a single retired Southern Pacific locomotive, 17 boxcars, 8 flatcars, and a single passenger-baggage car. The railroad formally opened to the public on September 1, 1907, less than four months after it had been founded. Unsurprisingly, one immediate problem that the railroad encountered was a negative relationship with the Southern Pacific at Chittenden. 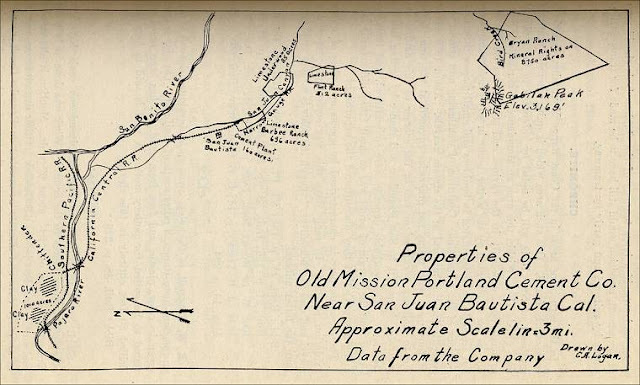 Although there were plans to connect the Ocean Shore track at Santa Cruz with the San Juan Pacific track at Chittenden, the Southern Pacific had made this virtually impossible and a junction at Chittenden was required, for which the San Juan Pacific paid dearly. 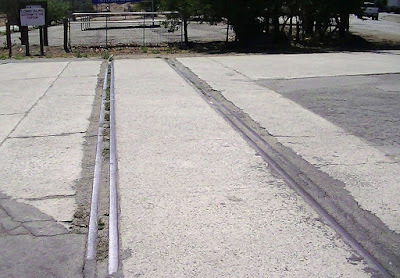 Two transfer tracks installed to the south of the Southern Pacific tracks acted as their holding yard, but the original plan to run the track over or under the Southern Pacific line never came to fruition owing to the failure of the Ocean Shore to connect its lines. Another problem proved to be customers. 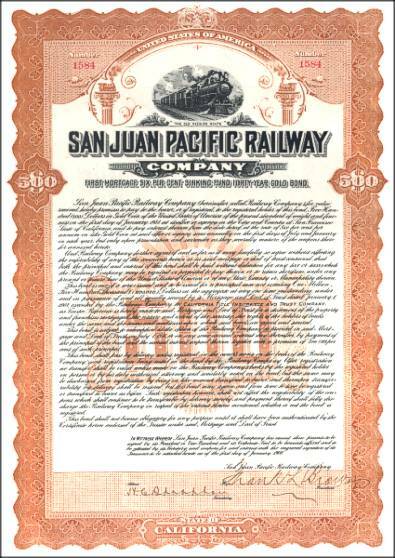 Much like the Pajaro Valley Consolidated Railroad, the San Juan Pacific was dependent partially on local farmers along the route, but the railroad was completed at the tail-end of the growing season forcing the railroad to wait a year before those profits would be realised. Meanwhile, the cement plant was still being constructed and was not expected to open until early 1908. Thus, passenger service ended up being the railroad's first venture, despite only having a single locomotive and passenger car. 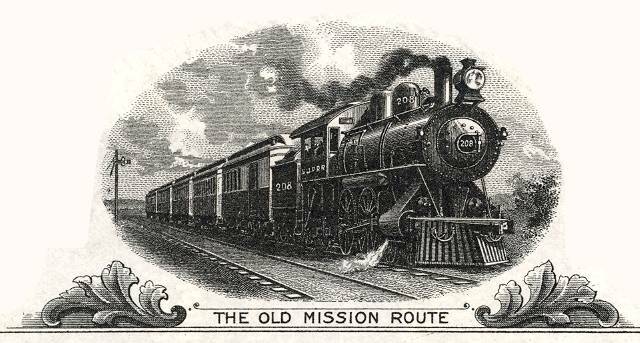 In mid-October, the company hired a local coach-driver as the conductor and branded the track "The Old Mission Route" in the hopes that Spanish revivalism and romanticism would draw customers to the isolated and decaying mission. Generally low maintenance costs and public interest in the line kept it alive that first winter. Unfortunately, a financial panic in November 1907 stalled all work on the connecting lines and also stopped construction on the cement plant. Everything hung in the balance. Meanwhile, another project was underway at the end of the San Juan Pacific route. On August 3, 1907, the narrow-gauged San Juan Southern Railway was incorporated to connect the cement plant to the limestone sources in San Juan Canyon. The overenthusiastic goals of the project visualised a six-mile track to a site called Flintsville, i.e. Thomas Flint's ranch. Furthermore, plans were put in place to extend this track another six miles to the Underwood Ranch. Ultimately, three miles was built by the time the November panic forced construction to halt. Whether the track was ever used is another question. There are no records attesting to narrow-gauged rolling stock owned by the company and the track, even if it were used. Company timetables in February 1908, however, suggest, probably inaccurately, that the track was not only used, but did in fact extend up to Underwood. But Interstate Commerce Commission records report in June 1909 that only three miles were built and it was no longer in use. Regardless, any evidence of this route has been removed by later roads that have since been built on the company's right-of-way. Things went badly for the San Juan Pacific after 1907. Revenue was severely down because of the panic and the cement plant was hardly functioning. Passenger serves ended in May, 1908, freight was infrequent. A harsh winter in early 1910 washed out track near the Pajaro River and it took months to repair them, and then in March 1911, the bridge over the river collapsed in a storm. It was not repaired until July, but by then it was too late. The company ceased all operations in November and was put up for sale in January 1912. For six months, the San Juan Pacific was a dead entity. Then, on May 12, 1912, a new organisation called the California Central Railroad was founded to attempt to rehabilitate the former right-of-way and put it to use. The purchaser was the Old Mission Cement Company, a new corporation that purchased the abandoned San Juan Portland Cement plant and all of its stocks, including those in the San Juan Pacific. This new railroad would not have the grandiose plans of its predecessor (although it would advertise them from time-to-time) and its corporate management would be entirely linked to the fate of the cement company. Only eight miles of track were maintained, that between Chittenden and the cement plant near San Juan Junction. From 1912 to 1916, the railroad was mostly a conveyor of equipment to the plant, which reopened in 1916. Old Mission Cement Company plant near San Juan, with tracks visible in the background and at left, c. 1915. From 1916 to 1929, the railroad operated daily, carrying cement, gypsum, oil, sugar beets, and general agricultural goods between the cement plant and the Southern Pacific mainline tracks. This new route leased a Southern Pacific locomotive in 1919 which completely replaced the old engine in 1923. In 1927, an old Ocean Shore locomotive, long since disused, was transferred to the line and replaced the leased Southern Pacific locomotive. The old rolling stock was eventually phased out for borrowed and leased Southern Pacific stock, and it is unclear if the railroad even had a passenger car after the old one was retired in 1919. 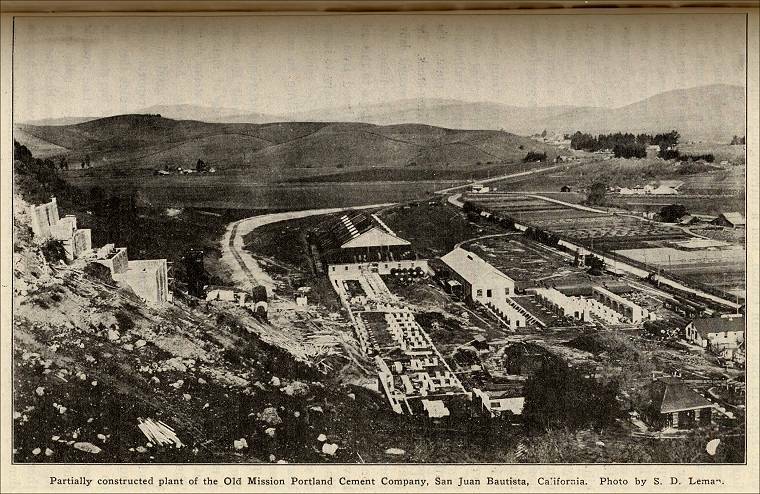 The Old Mission Cement Plant continued to operate until 1927 when it was taken over the the Portland Cement Company. The Great Depression forced the closure of that latter in late 1929 and the railroad ceased all service December 15, 1930. For the next seven years, the tracks rotted along their route, too expensive and unprofitable to remove but also too expensive to maintain. In December 1937, the old Ocean Shore locomotive ran one last time along the route, where at Chittenden it drove to Gerlach, Nevada, to start a new life. The tracks were illegally removed soon afterwards. The Interstate Commerce Commission officially granted the company the right to abandon the line on December 31, 1943. The cement plant reopened in 1941, but without using the tracks. It continued to operate into the mid-1970s. Very little survives of the Old Mission Route. No trace of the bridge over the Pajaro River appears to still exist, owing undoubtedly to the violent nature of the river during storms. The route followed State Route 129 to the south through River Oaks before crossing near the confluence of Pescadero Creek. From there it stuck closely to the north side of CA129, diverging with it at the California 101 intersection. From here, the route crosses through fields and the Anzar High School campus before merging with San Juan Road, diverging with that near the Prescott Road intersection. The route continues in a straight path until gently turning due-south around the eastern side of San Juan Bautista. The San Juan Station was located between CA156 and Nyland Drive. The route continued due south from here to the cement plant, ruins of which still survive off of San Juan Canyon Road just before entering the canyon. 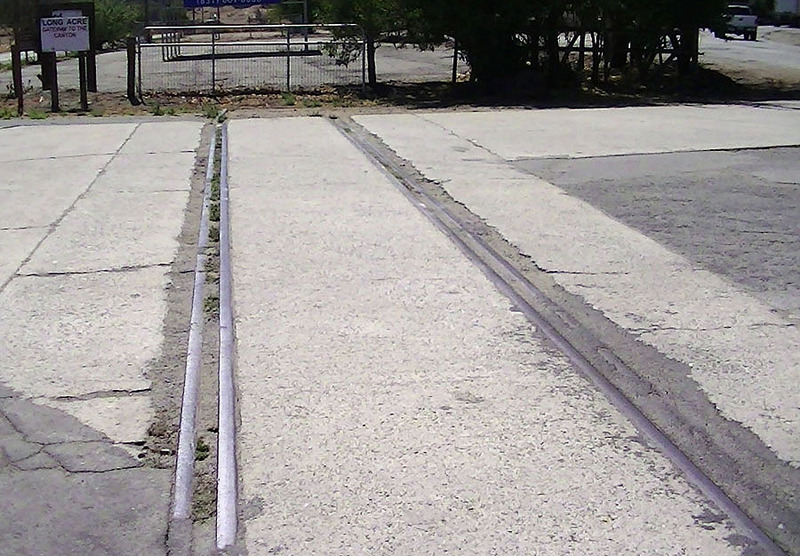 Unremoved tracks can only be seen in the road at the intersection of The Alameda and Mission Vineyard Road. Indeed, an unnamed road and San Juan Canyon Road (G1) briefly flank the former right-of-way south of this intersection. The route of the narrow-gauged San Juan Southern is easier to follow as it sticks to the corse of the western road that runs through San Juan Canyon. How long this route ultimately went is not entirely certain, although three miles of it were definitely attested to by multiple primary sources. Except for the extant roads built atop the right-of-way and the one instance of surviving track, nothing else appears to remain of this railroad. A plaque commemorating the railroad was erected by E Clampus Vitus and can be found on Mission Vineyard Road beside the San Juan Inn. Clough, Charles W. and Bobbye Sisk Temple. San Juan Bautista: The Town, the Mission & the Park. Quill Driver Books, 1996. Robertson, Donald B. Encyclopedia of Western Railroad History: Vol 4: California. Caxton Press, 1986.